As a teacher, I have to suffer through some God awful meetings. However, in the one I attended today, a spark of light burst in my brain that simply would not go out. I’ve long struggled with how to define “pacing”. I certainly know when it’s bad. But how would you define it, and then teach it to others? Pacing is time manipulation. The best line to describe this come from the movie Deep Blue Sea. 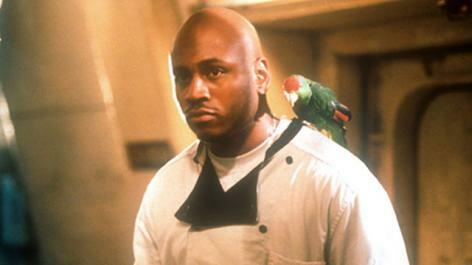 L L Cool J’s character is trying to describe Einstein’s theory of relativity. That ability to slow down or speed up time is what good writers, and directors do. The story below is a perfect piece to demonstrate how well pacing can twist time. A ripe guava is yellow, although some varieties have a pink tinge. The skin is thick, firm, and sweet. Its heart is bright pink and almost solid with seeds. The most delicious part of the guava surrounds the tiny seeds. The most delicious part of the guava surrounds the tiny seeds. 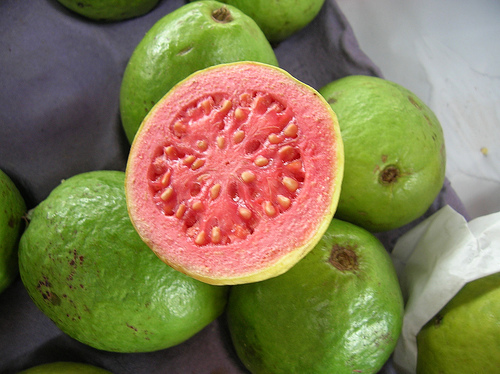 If you don’t know how to eat a guava, the seeds end up in the crevices between your teeth. When you bite into a ripe guava, your teeth must grip the bumpy surface and sink into the thick edible skin without hitting the center. It takes experience to do this, as it’s quite tricky to determine how far beyond the skin the seeds begin. Some years ago, when the rains have been plentiful and the nights cool, you can bite into a guava and not find many seeds. The guava bushes grow close to the ground, their branches laden with green then yellow fruit that seem to ripen overnight. These guavas are large and juicy, almost seedless, their roundness enticing you to have one more, just one more, because next year the rains may not come. As children, we didn’t always wait for the fruit to ripen. We raided the bushes as soon as the guavas were large enough to bend the branch. A green guava is sour and hard. You bite into it at its widest point, because it’s easier to grasp with your teeth. You hear the skin, meat, and seeds crunching inside your head, while the inside of your mouth explodes in little spurts of sour. 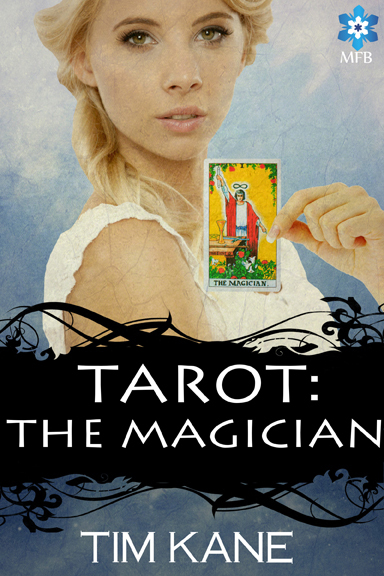 You grimace, your eyes water, and your cheeks disappear as your lips purse into a tight O. But you have another and then another, enjoying the crunchy sounds, the acid taste, the gritty texture of the unripe center. At night, your mother makes you drink castor oil, which she says tastes better than a green guava. That’s when you know for sure that you’re a child and she has stopped being one. I had my last guava the day we left Puerto Rico. It was large and juicy, almost red in the center, and so fragrant that I didn’t want to eat it because I would lose the smell. All the way to the airport I scratched at it with my teeth, making little dents in the skin, chewing small pieces with my front teeth, so that I could feel the texture against my tongue, the tiny pink pellets of sweet. Today, I stand before a stack of dark green guavas, each perfectly round and hard, each $1.59. The one in my hand is tempting. It smells faintly of late summer afternoons and hopscotch under the mango tree. But this is autumn in New York, and I’m no longer a child. The guava joins its sisters under the harsh fluorescent lights of the exotic fruit display. I push my cart away, toward the apples and pears of my adulthood, their nearly seedless ripeness predicable and bittersweet. Think, how much time has actually elapsed? It might have been only a few seconds, but it feels so much longer. That’s because the space within is filled with memories and emotions. Also, consider her movement. She stands still pretty much the whole time. Amazing writing. Now I’ll have to go and read the book. Ah Madame Bathory, the Countess who took the term “blood bath” to a whole new level. 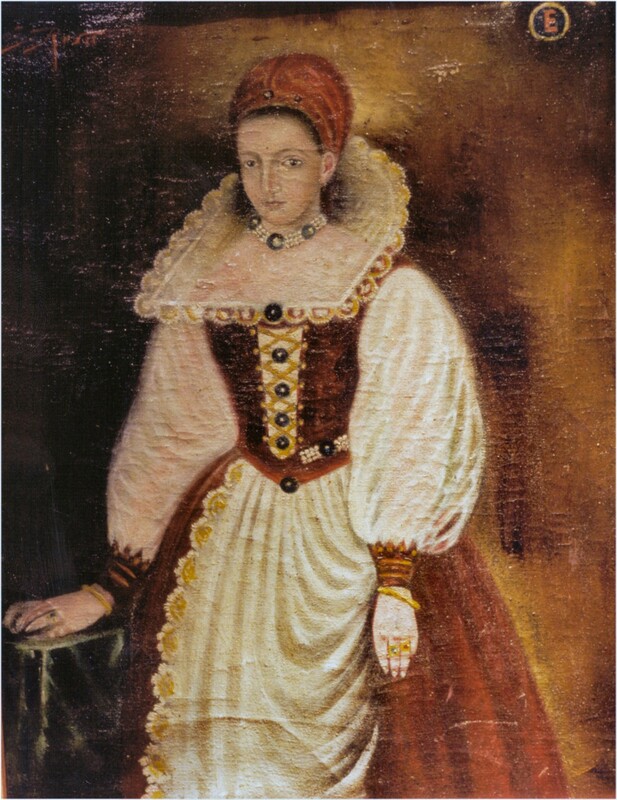 If you’re unfamiliar with the lady, she was a sixteenth century royal in Hungary who decided create her own fountain of youth from young woman’s blood. Specifically, she drained them and bathed in the blood. She might have been on to something. Now it seems that researchers have found evidence to support that young blood can restore metal health (to mice at least). They swapped blood between an older mouse and a younger mouse. The younger one’s brain began to age more rapidly and the older one (with the newer blood) showed more elasticity in thinking. It was able to solve water mazes quicker with fewer mistakes. This is a frightening prospect, not for the scientific advancement (which is terrific) but the implications for us. 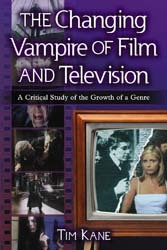 We already have fang bangers who dress and act like vampires. Some even delude themselves into believing they are the living dead. Now, bolstered by scientific evidence, will they round up the youngsters, Bathory style, and drain them to renew their flagging vigor? Don’t laugh, it’s a real possibility. Until then, keep a close watch on your children. The vampire wannabes are out there. 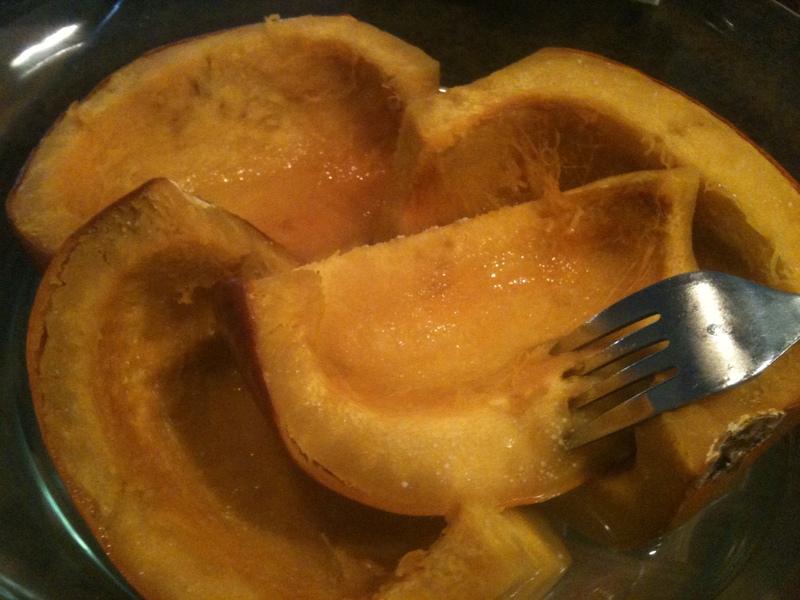 October means pumpkins, not just for carving, but gobbling up in soups, stews, pancakes, and pies. It all starts with a sugar pumpkin. I used to wonder what this was because they aren’t available at pumpkin patches. Search for pie pumpkins (or sugar pumpkins) at the grocery store. 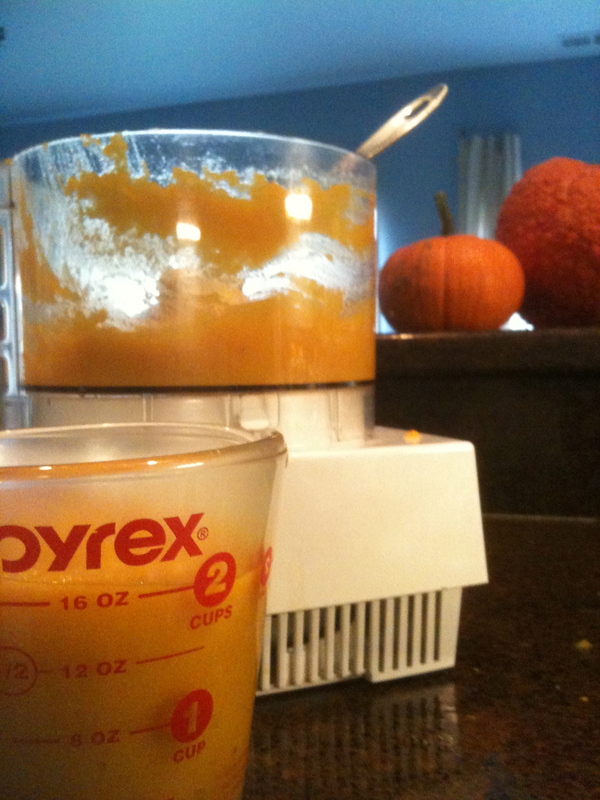 Transforming a pumpkin into puree is not as hard as it looks. Most websites will tell you crank up the oven and toss the pumpkin inside and wait. Yeah, I tried that. One problem, was the waiting. It takes time for the oven to heat up and quite a while for the pumpkin to cook. Worse yet, when I tried this the first time, I decided to add water to the glass pan while it was in the oven (did I mention that it was glass). Yes, shards scattered everywhere: in the oven, on the floor. I found a better way: Microwave. But let’s start with the slicing and dicing. 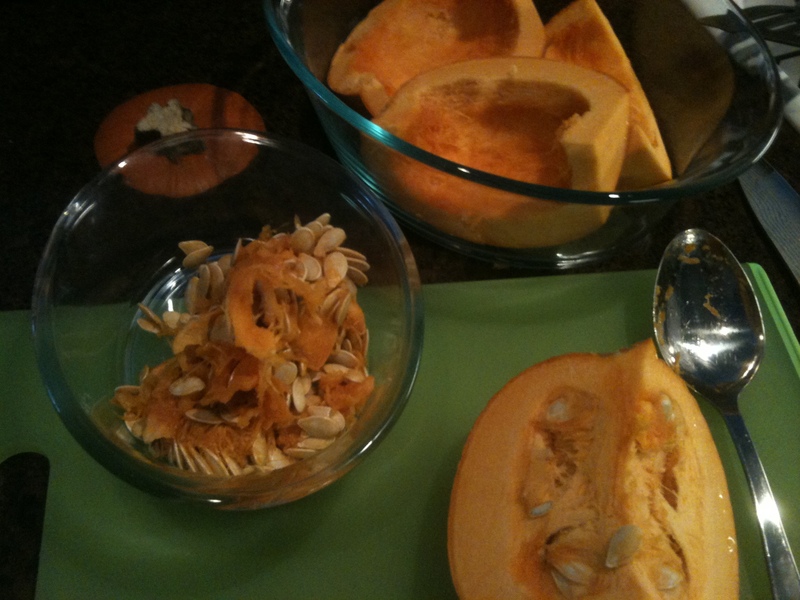 Cut the pumpkin into quarters and then scoop out all the seeds and gook. 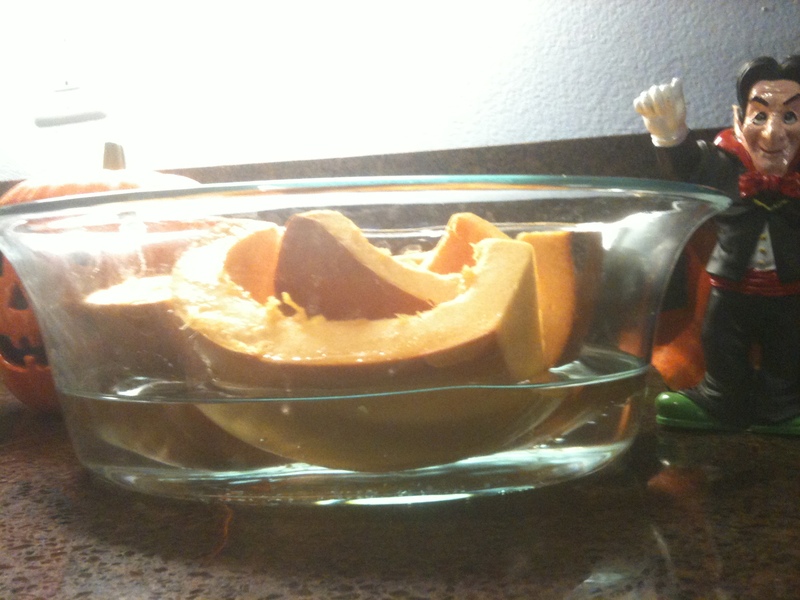 Make sure you place the pumpkin pieces into a microwave safe container. The secret here is the water. 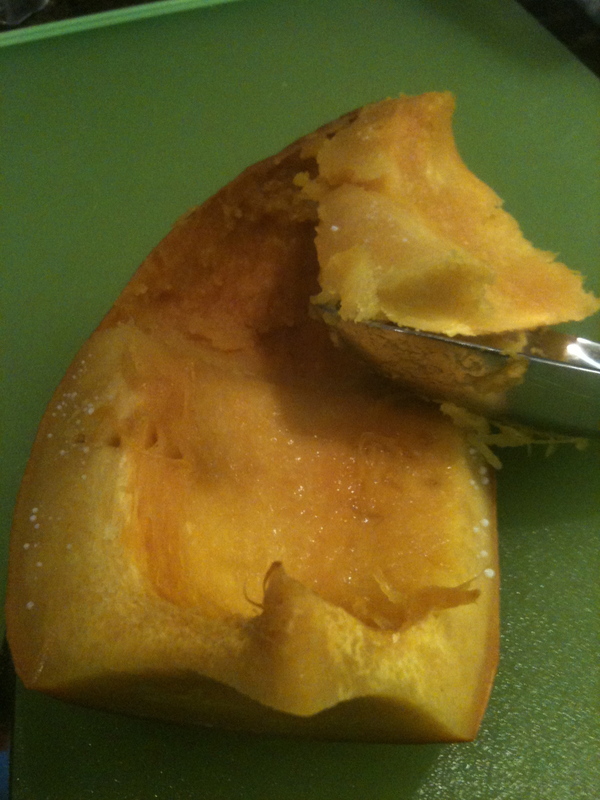 Just enough to come up to the pulpy part of the pumpkin. You’re basically steaming the pumpkin. Cover up the bowl (allowing a little space for super heated air to vent) and microwave for 10-15 minutes. With this pumpkin, 15 minutes was the magic number. You know you’re done when a fork goes straight through. Careful, when the pumpkin is cooked, it is crazy hot. Further proof that you’re on the right track is when the rind pulls easily away from the pulp. Now it’s time to puree. If you don’t have a food processor, don’t sweat it. Get a potato masher and go to town. 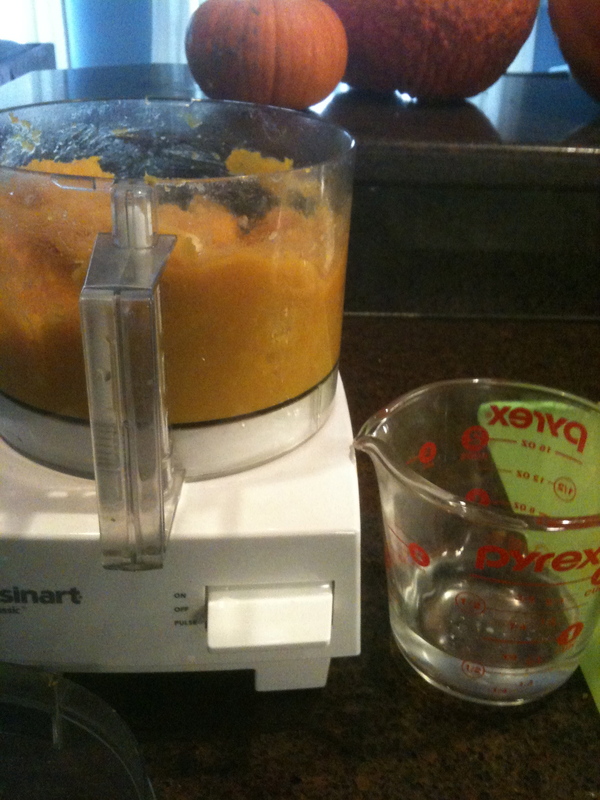 For the food processor, you may find that the pulp is too thick to spin. It just sits there like a slug. Try adding up to a half a cup of water. You’ll only need two cups to make a pumpkin pie (recipe in the next post). The rest you can save for pancakes, muffins, heck, I even added some to pasta sauce. It’s fall, go crazy. Imagine you’re an interior designer or contractor and you get contacted by a fellow who wants an iron maiden installed in his basement. Perhaps accessed through a secret door with a few traps. It makes you wonder, where do some of the horror movie villains get their homes made? Here are the top six bizarre home building projects that would drive any contractor nutty. I have a secret, I’ve always wanted to build a secret passage. It would be so cool to be able to access your den or writing room via a chamber that no one else can see. Yes. It’s everyone’s dream, right? 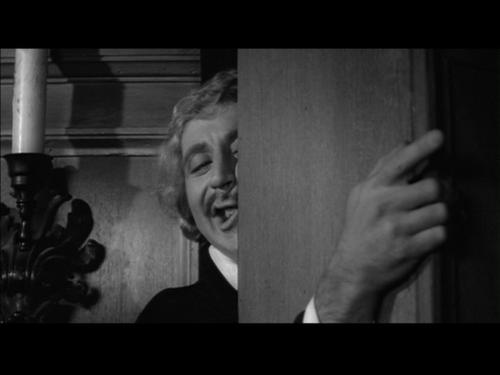 Of course, you’ve have to access it with a candle, just like in Young Frankenstein. I only hope I never get stuck like Gene Wilder. Imagine a clock pendulum swinging, only now, it’s set to slice you in half. I don’t even know where you’d have room to put this in any house, much less make it work. 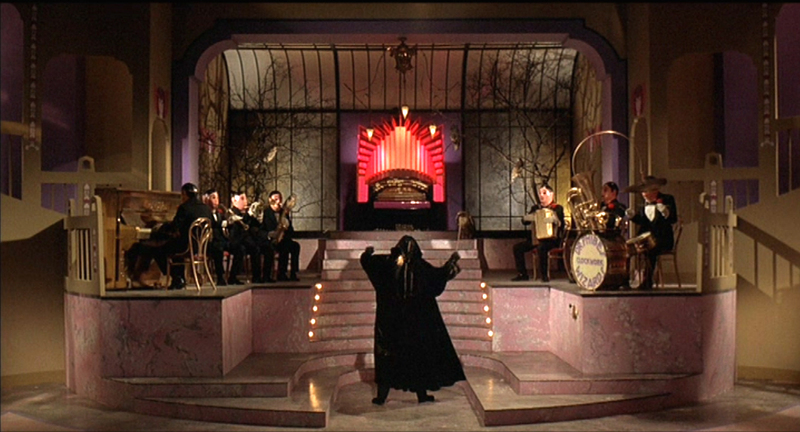 Only Edgar Allen Poe could dream this up and only Roger Corman could execute it. As kids, we all tried to dig a hole to China, but in horror flicks, holes in the earth tend to lead other places. In Lair of the White Worm, a nasty slimy serpent slithers up to chomp on young maidens. With that in mind, think how long it would take to drill this out? 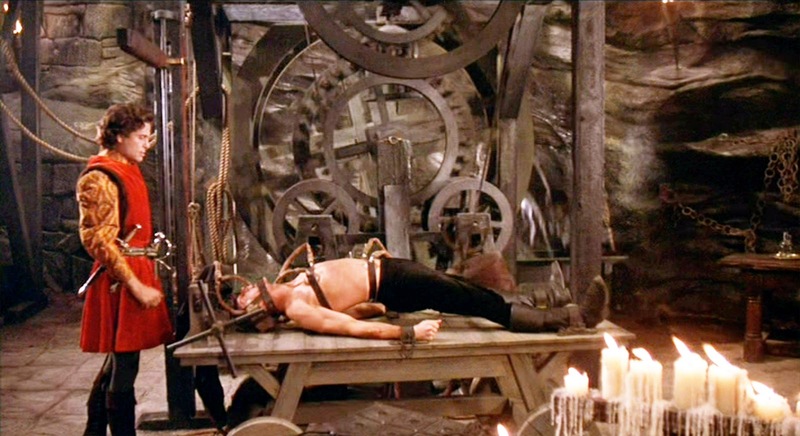 Not only is this my favorite movie, it also has it’s own torture equipment. Who knew? The machine is there to instill pain on its victims with suction. So basically its one giant Hoover. As an added bonus, it’s made entirely out of wood. That would take a fleet of carpenters to build. Sure, all your songs fit onto an iPod, but nothing replaces having live performers. Barring that, you could go the robotic/mechanical route. Nothing says creepy as faceless horn players. I’d like to see Apple market that. I put this as number one simply because…why? Why would you ever need a vat of acid in the floor other than to dissolve someone. I know there was some sort of explanation for it in the film, but let’s face it, death by acid is just awesome. It’s October and I’m watching Halloween Wars. No, I don’t style myself on par with the expert pumpkin carvers, but I’ve created some pulpy ghouls over the years. One of the best tools I’ve seen (and one I need to buy) is the bent wire stylus used by clay sculptors. Currently, I use a strawberry corer to make detail work on the face of pumpkins. But I’m going too far. 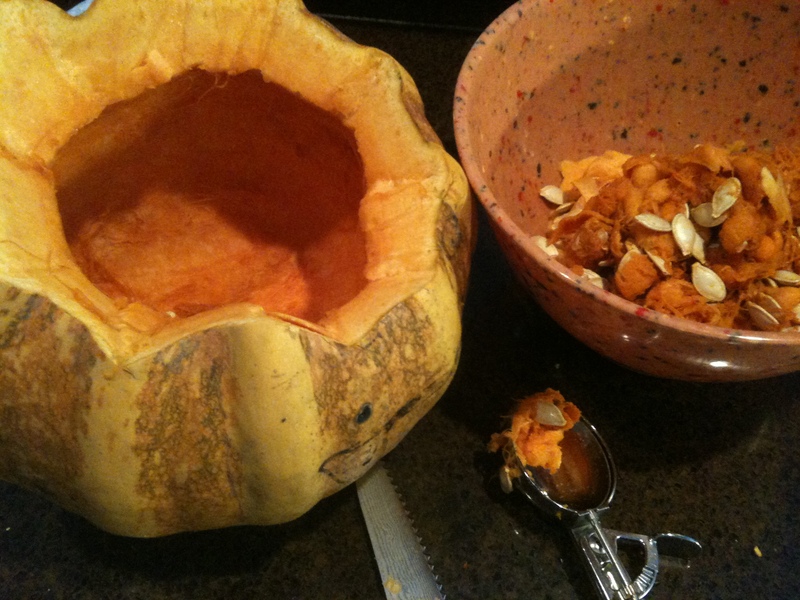 Most folk want to cut your classic pumpkin without all the hassle. I have a few tips. The ice cream scoop is great because the spoon has sides that are vertical (unlike a flat spoon) which makes digging into a pumpkin through a small hole easy. If you have one with a release lever (like the one pictured) then you never get your fingers gunky (although you loose out on all the fun that way). I typically use the bread knife to cut off the top because I’m going for power, not finesse. Once I get to the face, I switch to the steak knife. Serrated edges are the key. You want to saw through the pumpkin. 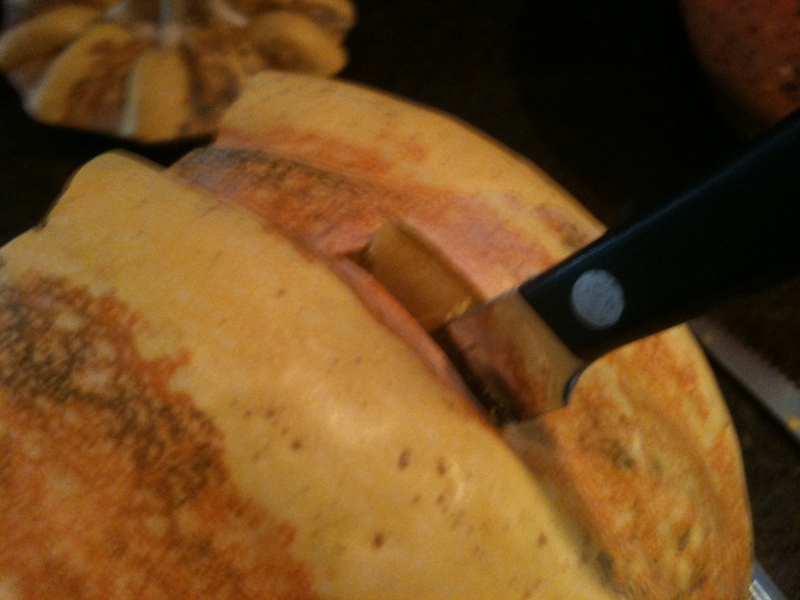 Nothing is worse than punching in with a standard knife and have the blade trapped by the pumpkin. Literally, you can’t move that thing. Cutting out the eye hole. Don’t be afraid to over cut the holes. Generally, they don’t show. Toss everything in a bowl as you go to ease clean up. 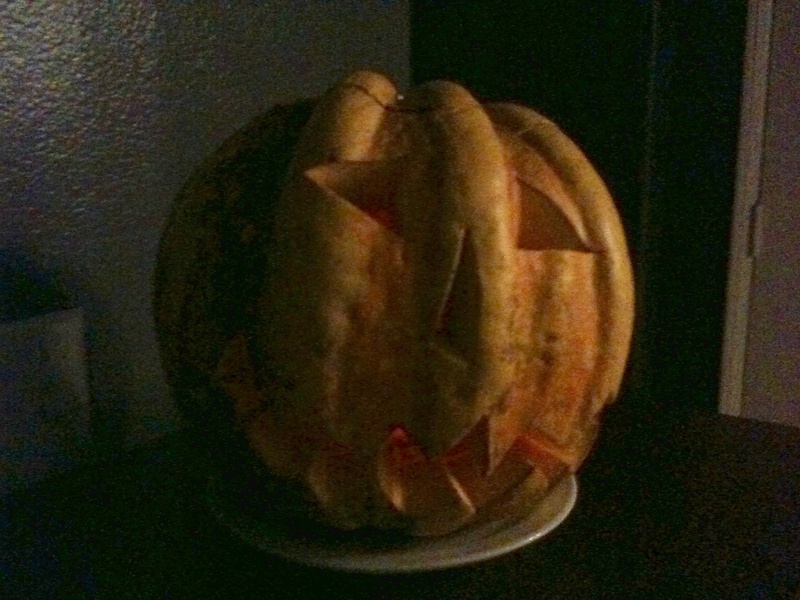 For the finished “classic” pumpkin, I use one of those battery-operated candles. These are great because you still get the flicker, but without any heat. There are all these opinions on how to preserve a pumpkin. Mostly, I leave them out. They’re going to rot. Accept it. If I do want to keep one, I stash it in the fridge. This will only work for one pumpkin, and only then if you can make the room.